The Spigen Tough Armor in gunmetal is the new leader in lightweight protective cases. 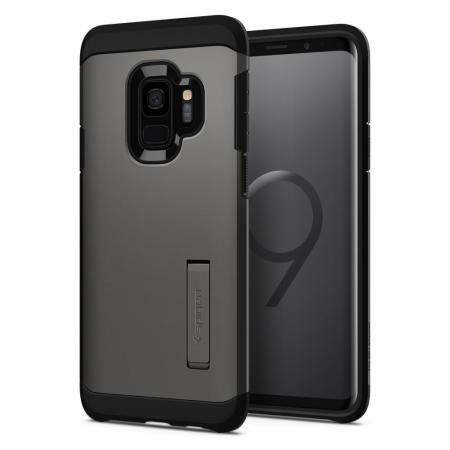 The new Air Cushion Technology corners reduce the thickness of the case while providing optimal protection for your Samsung Galaxy S9. Good quality rugged without being bulky. Corners are well protected. This is my second Spigen case and for me you cant beat them, tough as nails, easy to slip the phone out, excellent product. Great fit. Solid build. I have used these for my last 2 Samsung Galaxy phones. After two years the phones look like brand new. Mobile fun are superb with great service. The case feels solid and secure, it feels like it should do what it needs to do if it is needed. Very comfortable to hold, the grips down the side make the phone feel very secure in the hand. I bought this item based on past good experience with Spigen smartphone cases and I wasn't disappointed. Note that the 2 mm lip does not extend around the entire perimeter of the phone - only the top and the bottom.